"It is during our darkest, that our loved ones are closest." A24 has unveiled an official trailer for the release of Gus Van Sant's The Sea of Trees, an emotional drama set in Japan's mysterious Aokigahara forest, also known as the Suicide Forest (the same place the horror film The Forest takes place). This first premiered at the Cannes Film Festival last year to mostly negative reviews from critics, which is why there isn't too much buzz. Matthew McConaughey stars as a suicidal American man who ventures into the forest longing for his wife, played by Naomi Watts, and befriends a Japanese man, played by Ken Watanabe, while he's wandering around. The cast includes Katie Aselton, Jordan Gavaris and James Saito. We featured the Japanese trailer back in March, but this new US trailer looks better, like it actually might be worth seeing. McConaughey stars as Arthur Brennan, an American professor who travels to Japan in the midst of a personal crisis. As he wanders through a mysterious forest with a dark past, he experiences flashbacks of his fraught but loving relationship with his wife, Joan (Naomi Watts), and meets an enigmatic stranger, Takumi (Ken Watanabe), who is lost and injured. Arthur devotes himself to saving Takumi and returning him home to safety, and the two embark on a spiritual, life-changing journey of friendship, discovery, and healing -- one which may ultimately re-connect Arthur with his love for his wife. 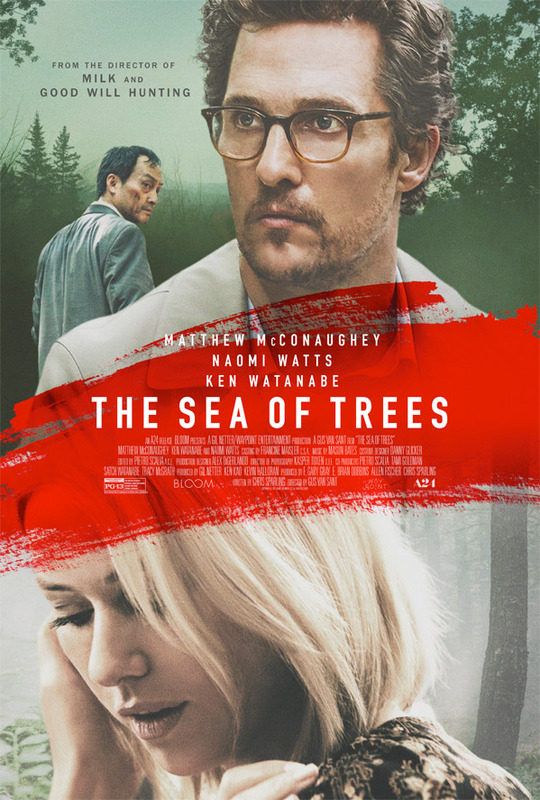 The Sea of Trees is directed by American filmmaker Gus Van Sant, of My Own Private Idaho, Good Will Hunting, Psycho, Elephant, Finding Forrester, Paranoid Park, Milk, Restless and Promised Land previously. The screenplay is by Chris Sparling, of Buried, ATM and The Atticus Institute. This first premiered at the 2015 Cannes Film Festival last year. A24 will release The Sea of Trees in select theaters starting August 24th this summer. Great cast, interesting director, nice photography, what looks to be an emotional story, and the trailer is good. How can it be anywhere near as bad as Cannes made it out to be? I'll see it. This looks like a deliciously intellectual film. I kind of would like to see what Herzog would do with the same framework. I hate to say this, but Watanabe could be the deal breaker for me. I just have the hardest time understanding him...everything else looks good, though. Vas Sant meets Malick...?